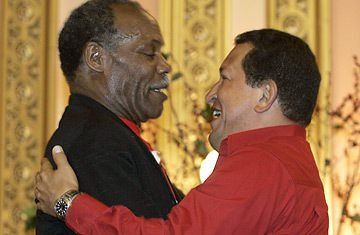 Venezuelan President Hugo Chavez (R) and US actor/activist Danny Glover hug each other in Harlem, New York. Oil-rich Venezuela's left-wing President, Hugo Chavez, is the shock jock of international politics  as he demonstrated in the U.N. General Assembly last year, when he referred to President George W. Bush as "the devil." To complement his anti-U.S. tirades, he has created a new alternative Latin American television network, Telesur  and has left free-speech advocates wringing their hands as he prepares to revoke the license of one of Venezuela's largest and most outspoken opposition networks, RCTV. But Chavez watchers aren't sure what to make of his latest media role: movie mogul. Venezuela's government confirms that it has approved almost $18 million to finance a movie about Toussaint Louverture, the leader of the epic 1791 slave uprising that helped make Haiti the first black nation to throw off the yoke of European colonialism. It's hardly unusual that Chavez would want to promote such an anti-imperialist story  nor is it surprising that the man who will make the film is African-American Hollywood star and civil rights activist Danny Glover, a close friend of Chavez and of former left-wing Haitian President Jean-Bertrand Aristide (who was overthrown and forced into exile in South Africa three years ago). So is Chavez, who has used his petro-largesse to build a raft of global alliances, now exploiting the big screen to spread propaganda for his socialist revolution? Chavez critics in Washington, like Florida congressman Connie Mack, are blasting Glover for cutting "a sweetheart movie deal" with Chavez, whom they denounce as a protege of Cuba's communist comandante, Fidel Castro. Glover is unlikely to be deterred by such comments: He is, after all, a Telesur advisory board member and a vocal Bush Administration critic who argues that Chavez has been portrayed unfairly in the U.S. At the same time, Aristide, who blames the U.S. for his downfall, likens his own story to that of Toussaint, who was later betrayed and died in France in 1803. But Glover insisted this week that Toussaint, for which he has been pursuing production funding for almost 10 years, won't be left-wing revisionism but rather a critical piece of the hemisphere's past that has been "essentially wiped out of our historic memory." Glover will direct Toussaint, which will be shot in Venezuela and co-produced by the Villa del Cine, a state-funded film and TV foundation. A Chavez adviser says the project is simply meant to help jump-start Venezuela's dormant film industry  and notes that Venezuela's is hardly the first government to subsidize moviemaking. It's common in many European nations as well as Latin American countries like Brazil and Mexico. "For a country like Venezuela, it's really the only way to build a cinema infrastructure," says the adviser. As for the built-in politics of the Toussaint story, he likens it to other liberation struggles such as that of Scottish hero William Wallace, brought to the screen 12 years ago by Glover's Lethal Weapon co-star, Mel Gibson, in Braveheart. Venezuelan media report that Villa del Cine is also planning to produce a film version of Gabriel Garcia Marquez's historical novel about South American independence hero Simon Bolivar, The General in His Labyrinth. Meanwhile, critics are denouncing Chavez's move to revoke RCTV's license as another Castro-style authoritarian step to snuff out freedom of expression, following recent legislation that criminalizes slander against public officials. Chavez's backers insist that Venezuela is still replete with privately owned media that openly criticize him, and argue that his move against RCTV is justified because the network openly backed a failed 2002 coup against Chavez and his democratically elected government. "I doubt," says the Chavez adviser, "that what RCTV did [in 2002] would be tolerated by any government in any country."